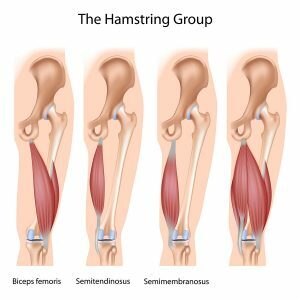 A hamstring strain is an injury to the hamstring muscles in the back of the thigh or the tendons that attach them to bones at the hip and the knee. This injury commonly occurs in sports that involve sprinting. They are painful injuries that can range from stretching the muscle fibers, to partial tears, or to complete muscle tears. Unless the tendon pulls off of the bone, most of these injuries heal without surgery. In this video, I discuss the mechanism of injury, diagnosis and treatment of a hamstring injury. The hamstring muscles are muscles in the back of the thigh. They attach by tendons at the hip and below the knee. These muscles are commonly injured in sports that involve sprinting. A hamstring injury often occurs when the athlete stands in a position of rest and starts sprinting suddenly. The athlete will often feel a sharp pain in the back of the thigh or just below the buttock. He might feel a pop. A doctor or sports medicine professional can make the diagnosis of hamstring strain simply by examining the athlete. The site of injury will be fairly tender to palpation, and there might be bruising at the site of injury. The athlete will struggle to fire the hamstring against resistance, such as bending the knee against the doctor’s resistance, due to weakness from the injury. X-rays are generally unremarkable, although they can occasionally show a small piece of bone pulled off the ischial tuberosity (SIT bone). An MRI can demonstrate the location and severity of the injury. In most cases, a patient with a hamstring strain or hamstring tear does not need surgery to recover completely. In rare cases in which the tendon pulls of the bone, surgery to reattach it can be necessary, though. Non-surgical treatments such as rest, ice and time will help decrease pain and swelling. As the thigh starts to feel better, the athlete can work with a physical therapist to increase range of motion and strength. When these exercises become more comfortable, we will allow the athlete to progress to conditioning exercises, such as jogging, before trying sport-specific exercises. This is a comprehensive Q&A collection on exertional compartment syndrome, hamstring injuries, Achilles tendinitis, piriformis syndrome and more.